NWA Democrat-Gazette/CHARLIE KAIJO Kinley Russell 9 and Faith Fritch 15 of Bentonville (from right) set up their 4-H club educational presentation board, Saturday, August 4, 2018 at the Benton County Fairgrounds in Bentonville. 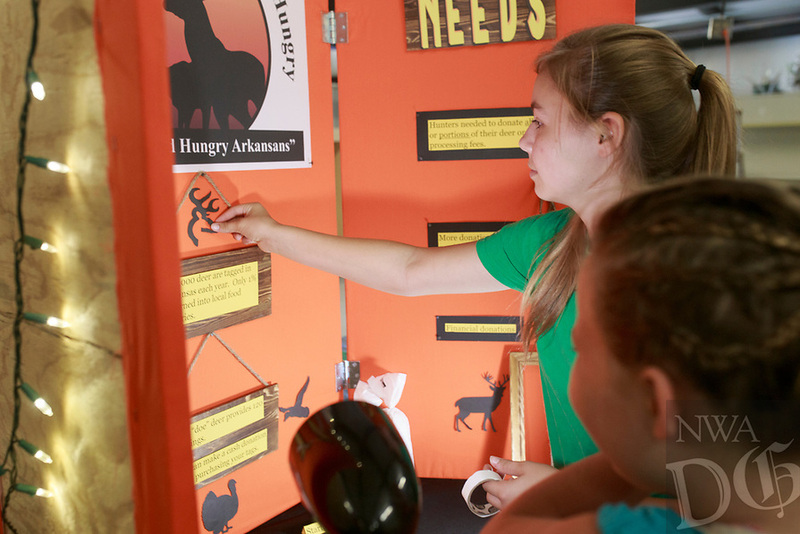 Their presentation is called Arkansas Hunters Feeding the Hungry. They want to encourage people to donate deer and other game to help feed those in need of food. Meat is hard to get in food pantries said Fritch. Of the 200,000 hunted game in Northwest Arkansas, only one percent is turned in to food pantries according to a stat on their board.